Beware the paths you take in the woods in pursuit of such things as Bigfoot, as they may lead you to odd places. In my own case it came to happy ends, as I am now a cartoon character serving as the basis of a series of books for children presenting Bigfoot and the study of it in a positive, appreciative light. For some investigators, and Bigfoot witnesses too, it ends in ridicule from the general public for believing such "odd" things. For those who have actually studied the history of the phenomenon, the possibility of an actual creature existing most parsimoniously explains the vast body of sightings reports and other evidence. For some, it is just good, plain fun. 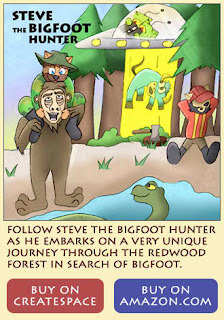 Last year Natasha and David Breen, artists and authors behind the FEISTY CATS and CATS IN BLACK series of books for young people, and residents of Humboldt County, Bigfoot Country, produced a first book in the Bigfoot series: "Steve the Bigfoot Hunter." 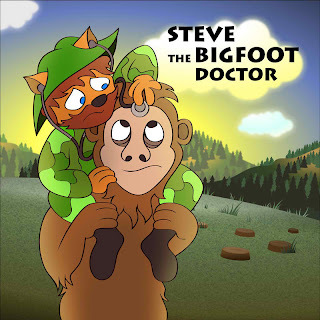 Now they are out with a new one, "Steve the Bigfoot Doctor." Both of these books are in rhyming verse and tell optimistic and cheerful tales that might just inspire the next generation of cryptozoologists. They are cute and funny, and to myself (especially as I am in them, along with my favorite hairy hominoid) rather endearing. The authors have produced a lot of other books. 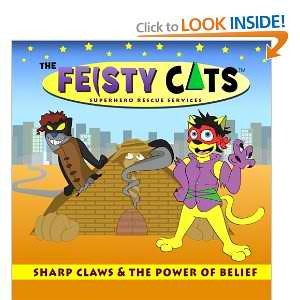 The FEISTY CATS is a kind of super-hero comic series for young teens featuring cat-people dealing with the complex moral, social and psychological issues of growing up and trying to do good in the world. The CATS IN BLACK (a pun on "Men in Black") series deals with more complex geo-political issues often involving conspiracy theories and "forbidden knowledge." In fact, the authors have seen their books featured on the web sites of both Alex Jones and David Icke. They have produced a set of books similar to the Bigfoot ones that feature a young David Icke, the notable British theorist responsible for the "Reptoid" theory, as a character. See below for an interview Bigfoot's bLog did with the authors, as well as to find links for viewing their web pages and books, and to make purchases if you'd like. Also, see below for what happened to some friends of ours when they mysteriously found themselves the stars of a very popular TV show, FINDING BIGFOOT. Yes, they were made into cartoon characters, too, even super-heroes. It is weird to see your friends on TV, but it is even stranger to see Matt lose his belly for a set of six-pack abs. 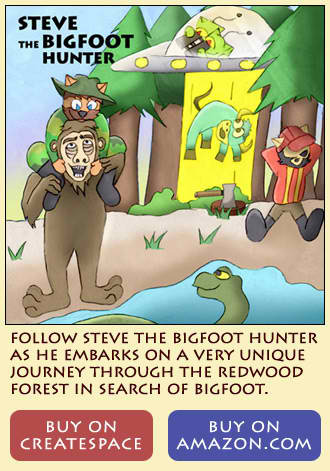 Coming soon... STEVE THE BIGFOOT RANGER! OK, I'll admit it, it's weird being a cartoon character, but also kind of cool. At least they didn't make me go Bigfoot researching with Justin Bieber, which was one of their earlier story ideas (see the animation below). BIGFOOT BOOKS: What is Feisty Cats and Cats in Black, and how did this series get started? Is it a superhero comic, a graphic novel, a kids' series? And what is its purpose? Tahsa: I've been drawing cartoon cats I called the "Feisty Cats" since I was eight years old. Just two years ago my brother David took interest in my characters and their concepts and helped me put a story line behind them which started the children's storybooks. David: Natasha works at a preschool, and the children she shared the Feisty Cats with, seemed to really like the Cats In Black characters the most. And this got us to thinking that we should just focus on something that is already familiar. Tahsa: The Cats In Black is now our main focus because people know who they are, but they are still different enough to make them our own thing. That is one of the reasons we made them cats. We thought Cats In Black would be a better means of telling conspiracy theory related stories in the background setting of a comic strip. BIGFOOT BOOKS: OK, for those who do not know about it, what is Cats in Black? Why are the characters portrayed as cats, and how does this reflect on ordinary human society? Are they a form of superhero, or are they meant to show the true potential of all kids and people to do great things? David: The Cats In Black plays off the "Shadow Government" conspiracy concept. We wanted to use characters that were already familiar to the public, but something also shrouded in mystery in order to give us the flexibility to make it our own and use it as a backdrop to play around with well known, relevant issues. You could think of the Cats In Black being the fictional characters who are responsible for all conspiracy theories . Our goal was to touch on popular conspiracy theories, while still remaining light humored and appropriate for all ages. Another reason we made them cats, was to appeal to kids. Tasha: The Feisty Cats was about superhero cats, and the Cats In Black were their body guards. The Cats In Black didn't have powers, they were like the Lex Luther of Feisty Cats. They have none of the powers but technique and other means at their disposal. 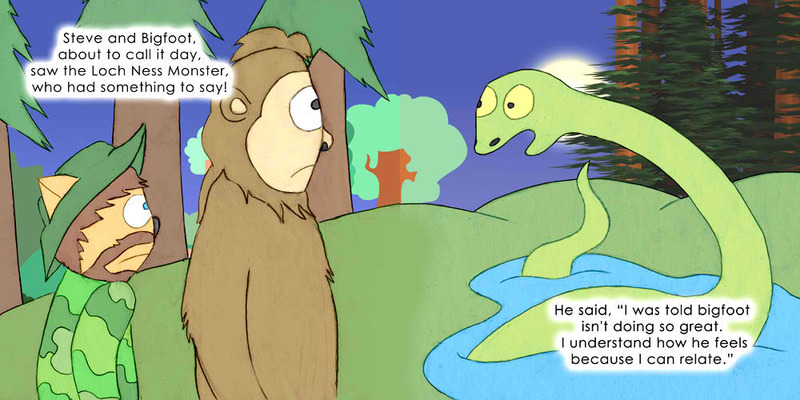 BIGFOOT BOOKS: Books for kids (though I'm sure grown-ups will enjoy these, too) usually have a MESSAGE, a moral of the story, or an inspiration to help kids in growing up and developing their personalities. How do you think your books function in this regard, and how did they grow out of your own childhood experiences? 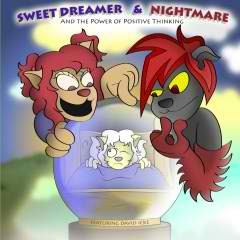 Tasha: Books for self empowerment and critical thinking are the primary concepts we are trying to get through to kids. Our books are just topics that we are interested in. They don't have anything to do with our childhood experiences. BIGFOOT BOOKS: How did the Feisty Cats originally evolve in your own life, Tasha? What did you see in them, and how is it that they have persisted until now that you, as an adult, are sharing them with the kids of the world? Tahsa: First I drew them out of my imagination and as I got older I started drawing characters I saw in people. Most of my Feisty Cats are inspired by people I admired and people who I thought would look cool as cat people. It's just persisted because that's what I love to do. I would stay in my room and draw cats all day, and eventually my brother noticed maybe there was something more useful we could do with my characters. And now it's really exciting that we have our books being sold online in Europe. BIGFOOT BOOKS: And David, what is your background, and how did you get involved in these stories and books? David: I liked to draw a lot when I was a kid. But as I got older, I lost interest in my art and spent most of my time playing video games. I even went to college hoping to become a computer programmer, but I'm glad that didn't work out. It wasn't until I discovered Macromedia Flash and started playing around with the concept of vector graphics, that I started drawing again. I had several years practice, designing logos and doing freelance art. When I started to become more interested in the Feisty Cats, I wanted to contribute with my computer art abilities, and we are where we are today because we both share the same passion for these characters and their stories. BIGFOOT BOOKS: You had another popular project, David, with large online following. Do you wish to mention that here? BIGFOOT BOOKS: Can we say “Movie Comics”? OK, to me, from what I’ve seen, the Cats books are basically Super Hero tales. How do you think the superhero model works for kids who have to live in the “Real World”? Also, how do your stories move from situations featuring kids in the struggles and issues of growing up to the topics of conspiracy theories and such things as Bigfoot? Are you, in the manner of much Science Fiction, addressing the Future, and the Unknown, and “Possible Things”? David: Yes, Movie Comics. A comic I illustrated and co-wrote with Salvador Garcia, an old friend who moved to Peru. For Cats In Black, we've abandoned the superhero model. Although it was a popular concept when we were kids - today I believe it's becoming a bit redundant. We wanted to do something more innovative - because having powers makes things too easy and unrelatable. The conspiracy theory crowd and new age ideas are becoming more and more popular, and we believe Cats In Black would be perfect for this emerging market. We are using conspiracy theories as the background model we work with when trying to convey our messages of self empowerment, thinking for yourself, and the power of positive thinking. Tasha: Our stories are based on conspiracy theories, so by their definition they are not fiction or nonfiction. It's up to the reader if they believe in conspiracies or not. 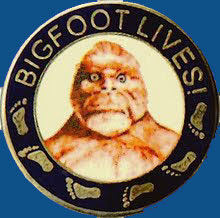 BIGFOOT BOOKS: Yes, indeed. Superheroes imply some kind of supernatural power or gift, whereas the average person has only their wits and imagination to get by with. Does battling against these dark, conspiratorial forces symbolize freeing the mind? Does it imply some kind of revolution that may restore humanity to greater dignity and strength, even though these characters are cats? What is it that these conspiracy theories represent for you? Aren't they kind of like the old good guy-bad guy scenarios of comics of the past, battles between good and evil clearly demarcated? David: The humor of our series is that it's from the perspective of the so-called conspirators. I don't see it as so much of a good versus evil situation. The Cats In Black are depicted as neutral characters by their nature who see their actions as simply doing their jobs. BIGFOOT BOOKS: Well, normally the Conspirators are seen as the Bad Guys… "THEM." Is this a counter-conspiracy, then? Recently, you have had a major breakthrough with the books, and that is the involvement of a certain individual (I don’t mean myself) who is now being featured in several of your latest titles. Can you talk about that, and how his theories of Conspiracy and Reality relate to your own books and creations? David: But yes, the concept of a conspiracy for us is when information is maliciously kept from the public. David Icke is the perfect leading character in our series, because we feel he best represents this up and coming movement of free thinkers. Tasha: Our rhyming picture books take David Icke's idea's of self awareness and staying positive amongst the chaos, and simplifies them into stories that is easier for kids to understand. We also feel the Cats In Black would appeal to adults who are not normally curious about these topics. BIGFOOT BOOKS: So, you are actually working with Mr. Icke’s approval and perhaps aid in the creative process? For our readers here, how do your books incorporate some of the aspects of Icke’s thinking, such as Reptilians, Multi-Dimensionality, Mind Control by the Illuminati, etc.? David: With this series, we plan to cover all of David Icke's topics of interest. We are directly working with his bookstore staff. They approved our earlier concepts and now we've been given the green light, creatively speaking. David: That's the fine line we have to walk. To make it appealing to adults, but still appropriate for children, and I feel we're doing that really well. Out there kind of thinking is perfect for children's books. Big red dogs seems kind of out there too! Oh, and thank you. It's very exciting. BIGFOOT BOOKS: Right! Kids are the most “out there” of all humans, usually! So, aside from meeting me, how did you get involved with BIGFOOT, and how does this down-to-earth hairy guy relate to the cosmic themes of the Cats in Black and Feisty Cats? What does Bigfoot mean to you? 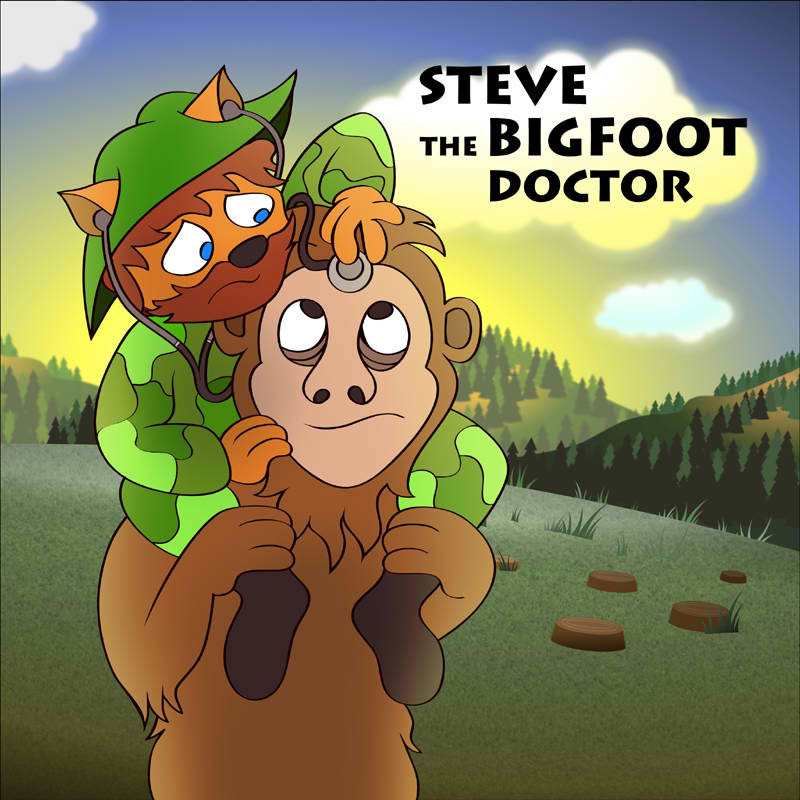 How does the cryptozoological quest of your character, Steve, relate to the themes of self-empowerment and free-thinking that you advocate in your other books? David: Bigfoot for us is just another phenomenon within the series. Like UFOs, abductions and anything else that has eye witnesses. Bigfoot falls into that special category of things that most people have to see to believe. 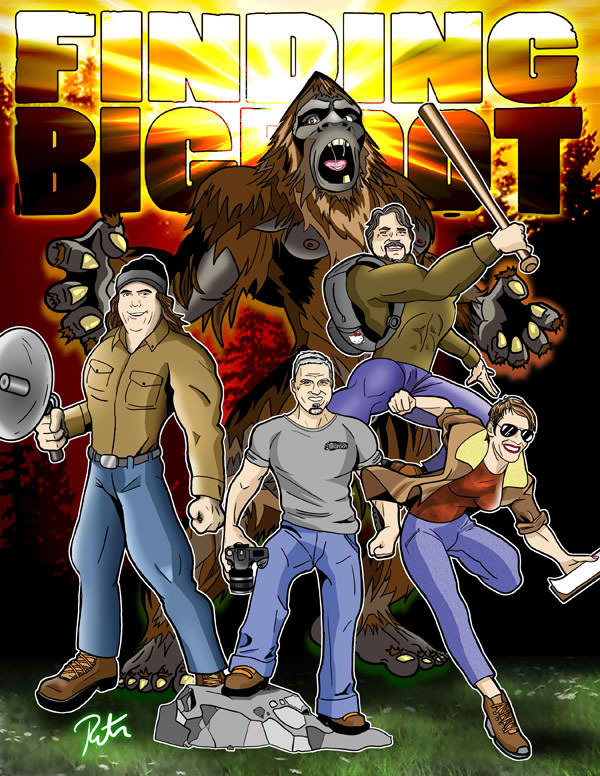 The character Steve, in Steve in Bigfoot Hunter represents a community of people who are passionately aware of a cultural phenomenon that the public at large assumes and interprets as a concept of fiction. BIGFOOT BOOKS: But, perhaps, the crucial question might be: IS IT REAL? Or, does it matter? What is "real" in the Cats series, and what are its goals in dealing with these stranger aspects of reality? I mean, beyond simple entertainment, what is at the other end of the exploratory process, whether it be exploring the "Crypto" or the "Conspiro" aspects of this world? David: Part of the humor and spin on the Cats In Black concept is that every conspiracy is real and they are the perpetrators. The goal of our series is to simply highlight these conspiracy topics in a humorous cartoon - an angle that is more attractive to your average person. We want to make information entertaining, and don't want to come off as preachy. Tasha: We are not saying every conspiracy is real, but that is what will make Cats In Black so interesting and entertaining. BIGFOOT BOOKS: Fascinating. A generation growing up with these books are quite likely to have a very open mind to the possibilities and hidden realities in this hyper-complex and ever-changing world. Do you guys have any other things to say about the series, or about life and “Reality” in general? Where are you heading in the future with your works? Also, where might readers find copies aside from your own web site and David Icke’s? Links would help. David: An animated television series is something down the road that we've always considered, but this book series is our main focus at this time, and we feel it's the best medium in which to present our material and tell our stories. 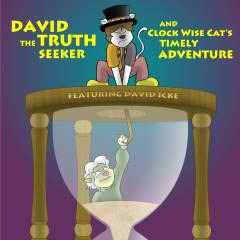 So if any your readers are intrigued by the concept we've outlined in this interview and want to help support David Icke and the Cats In Black, right now you can purchase our books directly from David Icke's bookstore. They have 60 copies of our books available right now - and more will be available as soon as we setup a drop-ship method with David Icke's bookstore. 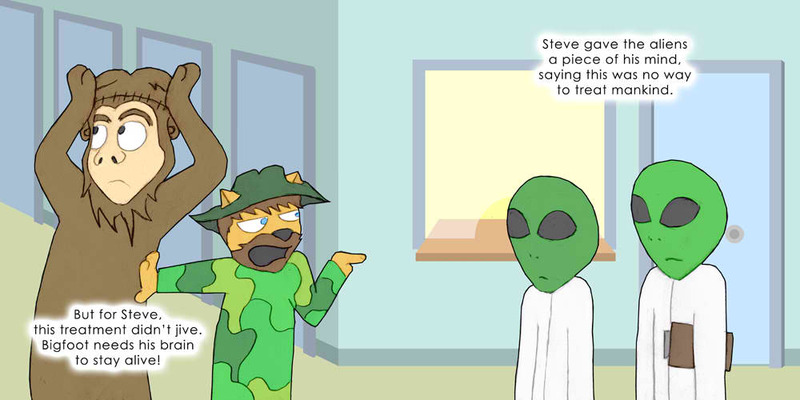 Also check out the Cats In Black website each week for a new conspiracy comic. It's been a fun interview. Thanks Steve! 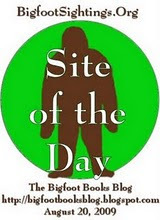 BIGFOOT BOOKS: OK, thanks to both of you! I look forward to seeing where this fascinating series will travel both here on earth and out there in the Cosmos. Best to both of you! 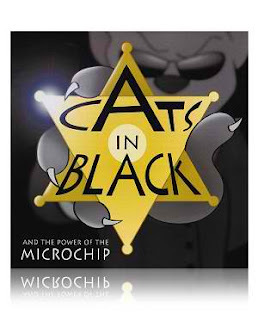 Cats-In-Black-And-the-Power-of-the-Microchip may also be found on the ALEX JONES BOOK PAGE, too. 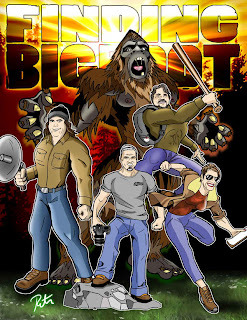 made into cartoon characters, our friends from FINDING BIGFOOT became super heroes through the pen of artist, Rictor Riolo. Check out his hilarious cryptozoological art through the link below. View full-sized versions of these images through his DEVIANT ART GALLERY. Me kind of angry too. Me get made into cartoon and look, me all snaggle tooth growl and mad eyebrow. That how me really look? Plus me have talk bad this like but that not how me really talk. You know they say Bigfoot talk English, Spanish, Russian, Me a linguist, me even talk in your mind use MindSpeak if you let me. This blog is copyright and all that jazz, save for occasional small elements borrowed for "research" and information or satirical purposes only, 2012, Bigfoot Books and Steven Streufert. Borrowings for non-commercial purposes will be tolerated without the revenge of Angry Bigfoot, if citation and a kindly web-link are given, preferably after contacting us and saying, Hello, like a normal person would before taking a cup of salt. No serious rip-offs of our material for vulgar commercial gain will be tolerated without major BF stomping action coming down on you, hu-man.